If you caught our Friday Favorites-Vacation Recap, you would have seen that we recently spent some much needed relaxation on the beaches of Aruba. Vacationing was something neither my husband or I were ready to give up on once the kiddos came along. We plan to pack everyone up at least once a year for some sort of family getaway. But, with the fun of a vacation also comes the travel. This is not exactly my favorite part of the experience. SEATS: the morning before our flight I logged online to view the available seats again and quickly changed ours to a row that was open and no one else was sitting in. That's an ideal case that won't always happen but you never know. 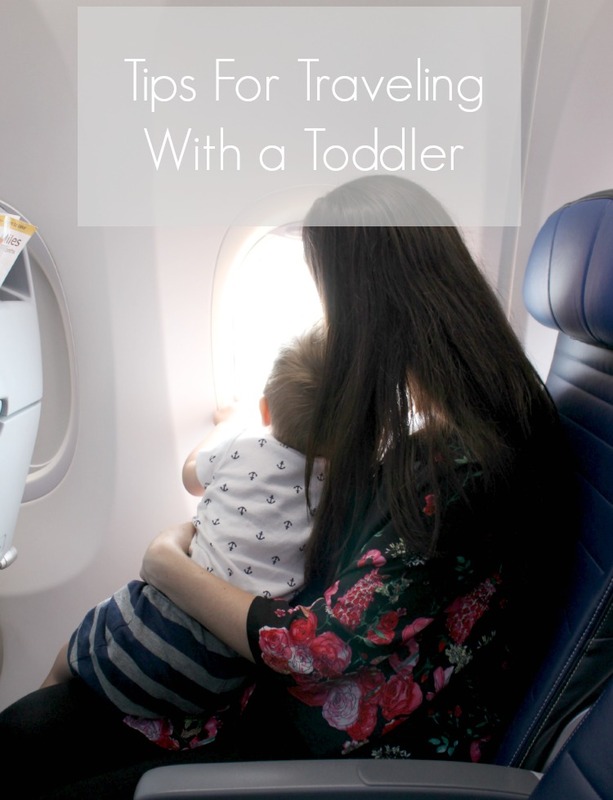 Also, if you have a little one that you think will want to look out the window go for a window seat. Think you'll be up and down a lot? Then go for an aisle seat. STROLLERS: if you're traveling with a stroller, what's worked best for us, is having it with us in the airport instead of checking it. You never know when there might be a delay or when you might want to walk them around. We had no problem bringing it right to the gate and tagging it there. WAITING TO BOARD: this made a big difference for us. Instead of getting on the flight right away when it was our section to board we waited it out in the airport. It just made more sense to us instead of having him wait and stay seated for an extra half an hour longer than he needed to on the flight. IT'S OK TO GET UP AND WALK: adults in general have a hard time sitting still for awhile so expecting a toddler to do the same is just silly. Once they took the seat belt sign off we did go and let him walk up and down the aisle. My husband and I just took turns doing laps with him and he ended up making a few friends along the way. SNACKS: snacks, and more snacks. Kids love to munch on things and while that might not be your philosophy at home, throw all of that out the window. Not only does snacking keep them somewhat occupied but the chewing, sucking, or drinking helps with their ears on the plane. ELECTRONICS: we aren't big into sticking a tablet or phone in our little guys hand, but for situations like this we'll make an exception. Our flight didn't have wifi included and we didn't find it necessary to pay extra for it. We downloaded a few free Fisher Price apps before hand that didn't require access to wifi. We also had a few videos saved to our phone that kept his interest for a little while. TOYS: we kept a small toy that he had never seen before and took it out on the flight for the first time. Since it was new and interesting he was amused for a little while. DIAPERS AND WIPES: keep them accessible! The bag you are going to place under your seat, leave them in there. Don't put them in the bag you are going to put in the overhead and then find yourself searching around for them when you need them. GO WITH THE FLOW: this kind of seems like a no brainer but I'll say it anyway. At first we had this grand idea that he was going to nap on the flight, sit in his seat, look out the window, snack and play. Instead he seemed to be more interested in pulling the shade up and down and saying, no light! As for the napping part, yeah, that never really happened. We didn't expect that half of our flight we'd be walking up and down the aisle with him or that he'd never really settle in for a nap. I would have never guessed he would've kept himself occupied by sticking crayons down his shirt and then taking them out. Over and over again. By the time he was done his onsie was so stretched out that I hope people didn't think we were grabbing him by his shirt. Oh well, he was happy and got a big kick out of it. Getting yourself worked up won't solve anything and after all once the travel part is over you want to be able to enjoy your trip.